The turkeys are holding a protest to remove Turkey from this year's Thanksgiving feast menu. Can you help them by finding a suitable replacement food in time for the big feast this year? Note: This event was only available from 22 November 2011 until 6 December 2011. 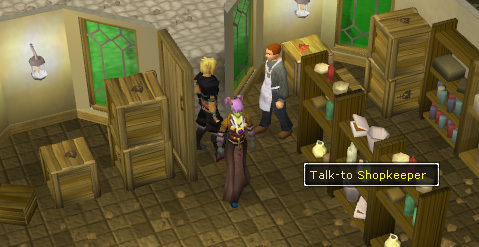 Speak to Captain Turkerton outside the Cooks' Guild in Varrock. 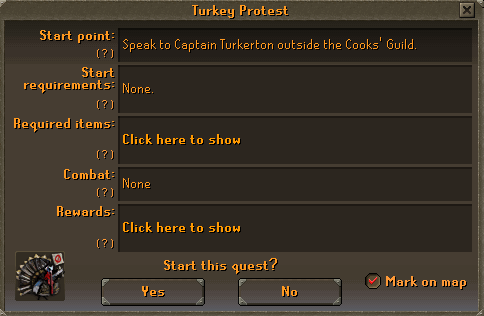 To begin the event, speak to Captain Turkerton outside the Cook's Guild, just outside of Varrock. Ask him what exactly he is protesting about, and he will inform you that the turkeys gathered are protesting to have Turkey removed from the Thanksgiving menu for Varrock, as they are tired of seeing their families slaughtered year after year, except for Mackers. Mackers is there for cake! The Captain will then ask you to go and speak to King Roald in Varrock palace on their behalf. Copious amounts of fruit and veg from the general store, to make up for the lack of turkey! You can obtain the items in any way you wish to, there is no particular order, however, this guide will do them in the order they appear in the list. 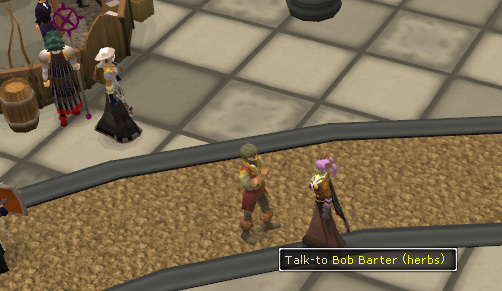 Bob Barter is in the North-West corner of the Grand Exchange. Tell him King Roald needs some herbs and spices for his feast and he will agree to supply them for you. The Blue Moon Inn is situated just North of the Southern Entrance to Varrock. Speak to the bartender, and tell him King Roald is in need of a delivery, he agrees and will get it sent off soon, he says. The general store is situated at the Southern end of Varrock Square. Go inside and speak to the shopkeeper, not the shop assistant, and tell him the King needs some goods delivered. He agrees to send the items to the King. After doing all three of these you decide to return and inform the King that your job is complete. Return to Varrock Palace and talk to King Roald again. He tells you to return to Captain Turkerton and tell him to leave Varrock alone. Return to Captain Turkerton, still located outside the Cook's guild, and tell him Turkey has been officially crossed off the menu this year. 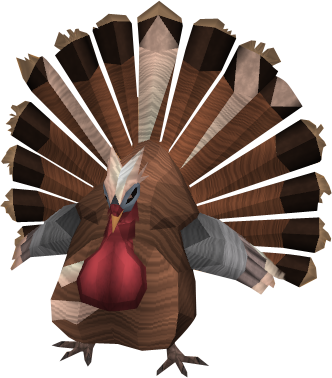 He thanks you and tells you that any herald in Varrock will now present you with a cape with the Turkey crest on, and that you should wear it with pride. However, at this point, a Varrock guard arrives and informs Captain Turkerton that he is under arrest for conspiring against the Crown. He informs you that he has been ordered to carry out the execution (with no trial?!) of Captain Turkerton, unless he can find a suitable character witness to get him off the hook - this is where you come in. You have the choice of either vouching for him, or allowing him to be killed. Select the option in which you offer to be his representative. Captain Turkerton thanks you and tells the other turkeys their work is done, and that it is time to leave. The turkeys then totter off, to the dismay of the guard who informs you the King only ordered the arrest in the hopes that he could get at least one turkey for his feast! Sneaky King! 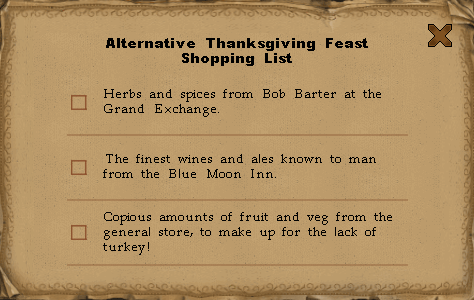 Select the offer in which you state Turkey is too tasty to give up, send him to the Cook's Guild! Captain Turkerton will be outraged that he is to be put to death, and at this point, the rest of the turkeys, sensing their peril, abandon him. The guard will then frog-march Turkerton into the Cook's guild, where we can but assume he is to be prepared for the feast! 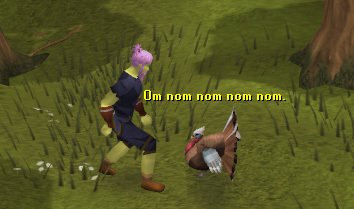 Mackers the Turkey decides to follow you around RuneScape upon completion of the event, in search of cake! Mackers is already full grown upon completion, but does not fend for himself in the big wide world. To keep him happy, you must feed him cake! Falador: Near the fountain south of the Falador Party Room. Lumbridge: Just south of the Furnace. Varrock: Near the fountain north of the Archery Shop. 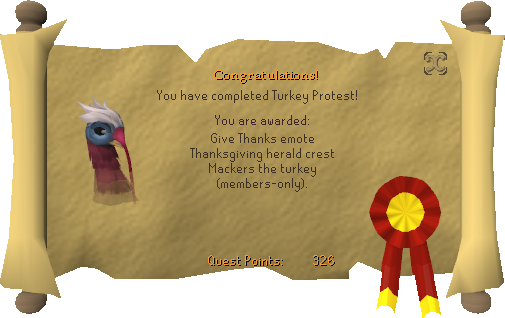 The "Give Thanks" emote will be enhanced for players wearing the Turkey Herald Cape.